months back or check out their blog copacavana.life for some great humor and van improvement tips. Where are we going to sleep in this city tonight? Where are we going to get water? How are we going to fit that thing in the van? Where will we shower? How do we fix that without costing an arm and a leg? You’ll have to answer all of these questions on practically a daily basis, and you’ll come up with some pretty creative solutions. 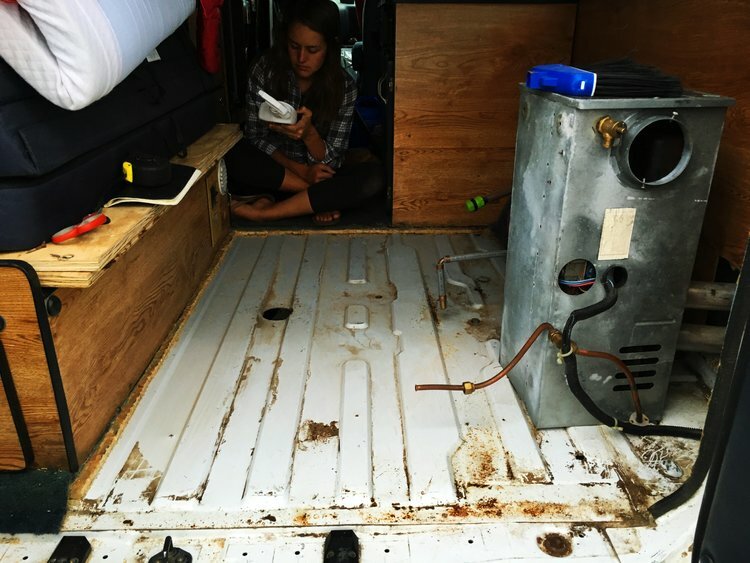 A few months into our trip, we found a water leak that had slowly destroyed the rear section of our van. Far from home, we figured out how to tear out and rebuild the back of our van in a hardware store parking lot with hand tools and a rental drill, all for around $150 bucks. When you’re living small and self contained, it becomes very apparent what you consume. It will bring a sense of mindfulness towards what you go through on a daily basis, and (hopefully) inspire you to limit your impact. We track how much we spend monthly on fuel and food. We also track the types of food we buy (because it's entertaining to know we average 3 bananas a day and pounds of peanut butter a month). We try to eat local fruits and veggies when we can, for both environmental and monetary reasons. We select foods and goods with minimal packaging, and save our produce bags to use for trash. Everything disposable that’s brought into the van eventually needs to be carried back out as garbage...so it creates a very direct relationship with our waste. We get clever with meal ideas when it's close to our next grocery run, to make sure we don't let any food go bad. We travel slow and ride bikes around cities, which helps with fuel use and costs. We try to be as mindful of these factors as possible and keep our consumption and waste to a minimum. Seriously. This is a thing, it will happen. Traveling without a bathroom means making due with what’s available. Porta potty? Gas station? Pit toilet? You’ll start to figure out which ones are most likely cleaner than others (finding the one that is a little further walk away from the parking lot). You’ll learn to B.Y.O.T.P. You’ll get some leg toning in when you find one that is less ideal (squat time!). You’ll use a lot of hand sani. But you’ll be cool with it in no time. Vans are small, houses and (most) apartments are not. It’s easy to let your “things” build up over time...trust us, we know, it happened to us too. When moving your life into a van, you need to pare down to the bare essentials, and you will cherish the items you own that are multi-purpose. You’ll also learn to be an expert packer and jenga master...you will be surprised at what can fit in a small space if you arrange it properly. As you continue to live in the van, you’ll discover more things that you brought and don’t need. You’ll buy less stuff, you’ll learn that your needs are simple, and it will feel good to live so light and minimally. Did the van overheat? Perfect time for a quesadilla break! Broken down on the side of the road? Pull out the shop manual and learn how to fix it...or see it as an opportunity to meet locals who are willing to help (they’re always the cool ones). Raining all day? The van could use a cleaning and a re-org anyways...and I need to put a dent in that book. Tired from a long day of driving? The ultimate nap spot is probably right behind you. Have weird neighbors? Go find better ones! Have to sleep in a Walmart parking lot? Go see what they sell in there and check out the locals in their natural habitat. When you don’t have anywhere to be, and everything you need is within an arm’s reach, you learn to slow down and appreciate the moment that’s right in front of you. Sounds cliche, but we're serious, and it's real. You’ll pull off on side roads you normally would’ve passed, you’ll stop at the weird roadside shops in the middle of nowhere, or you’ll explore that valley you would’ve missed if you were worried about getting to the next spot. When you’re falling in love with a place but planned to move on, you can put that on hold and stay awhile. You’ll learn to ignore those urges to follow a plan and check things off the list, and learn that it will all turn out okay anyways. To travel slowly is a truly special experience, and we wish everyone can experience it at some point in their lives. Vans break down, especially old ones. Luckily, some of the basics are easy to fix, and even understanding the problems will help you get better service from a mechanic....either way it will save you some money. 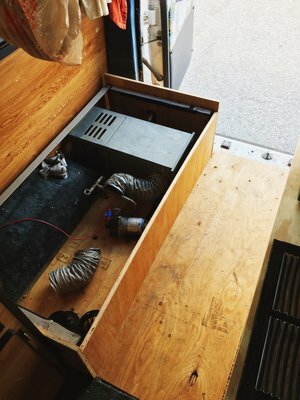 Get a shop manual for your van, read some forum posts, try to figure it out. Even if it’s hard and you can’t do it yourself, it’s still a learning experience and you’ll get closer the next time. When you spend every day outside frequenting our National Parks, State Parks and other wild lands, you find a surprising amount of trash in parking lots and along trails. You find spots where people have scratched their names into beautiful rock and trees. You see people disturbing animals who are just trying to do their thing, selfishly so they can snag a photo. Worst of all, we see a lot of toilet paper in hidden spots by turn outs and on the other side of trees. It gets tiresome and honestly a bit sad that people don’t respect the few wild places we have left. We always carry a trash bag on hikes for our own waste, but also to collect garbage we find along the way. We know that we are also utilizing these parks, just as everyone else there, but try to be the best examples we can be to leave no trace, to not deface nature and to not contribute to “deer jams”. We’ve learned how to sport and trad climb, grabbed quick beers, joined in on a Mexican food potluck, worked in organic gardens, surfed in Canada, had jam sessions, shared ice cream in LA, drove far up narrow dirt roads to find the ultimate Oregon campsite, and much more - all with friends who we didn’t know six months ago. The friends that we’ve made are from all walks of life and all ages. It’s been very inspiring to meet and hear the stories of other full time travelers, weekend trippers, or those who live in the communities we find ourselves visiting. for some in depth knowledge and insight, Q&A, recommendations and testimonials.